An oak savanna is a type of savanna, or lightly forested grassland, where oaks (Quercus spp.) are the dominant trees. These savannas were maintained historically through wildfires set by lightning or humans, grazing, low precipitation, and/or poor soil. The oak savannas of the Midwestern United States form a transition zone between the arid Great Plains to the west and the moist broadleaf and mixed forests to the east. Oak savannas are found in a wide belt from northern Minnesota and southern Wisconsin, down through Iowa, Illinois, northern and central Missouri, eastern Kansas, and central Oklahoma to north-central Texas, with isolated pockets further east around the Great Lakes including Ontario. The bur oak (Quercus macrocarpa) is the dominant species in northern oak savannas, although black oak (Quercus velutina), white oak (Quercus alba), and Hill's oak (Quercus ellipsoidalis)are sometimes present. The dominant tree in the south is usually the black oak (Quercus velutina), although the chinquapin oak (Quercus muhlenbergii), post oak (Quercus stellata), and black-jack oak (Quercus marilandica) are also common. The flora of the herbaceous layer generally consists of species associated with tallgrass prairies, both grasses and flowering plants, although some woodland species may be present. There are also a few species that are unique to oak savannas. Oak savannas, because of their mixture of grassland, woodland, and unique savanna species, typically have a higher plant diversity than grasslands and woodlands combined. 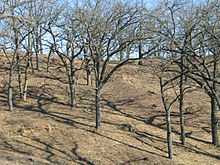 Before European settlement, the oak savanna, a characteristic fire ecology, was extensive and was often a dominant part of the ecosystem. Fires, set by lightning or Native Americans, ensured that the savanna areas did not turn into forests. Only trees with a high tolerance for fire, principally certain oak species, were able to survive. On sandy soils, black oak ( Quercus velutina) predominated. On rich soils bur oak ( Quercus macrocarpa) was the major tree in Midwestern North America. These savanna areas provided habitat for many animals, including American bison, elk, and white-tailed deer. 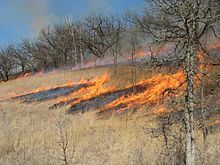 The most fire-tolerant of the oak species is the bur oak ( Quercus macrocarpa), which is especially common in hill-country savannas in the Midwest. European settlers cleared much of the savanna for agricultural use. In addition, they suppressed the fire cycle. Thus surviving pockets of savanna typically became less like savannas and more like forests or thickets. Many oak savanna plant and animal species became extinct or rare. ^ McPherson, Guy R. 1997. Ecology and Management of North American Savannas. University of Arizona Press, Tucson. ^ Anderson, Roger A., Fralish, James S. and Baskin, Jerry M. editors.1999. Savannas, Barrens, and Rock Outcrop Plant Communities of North America. Cambridge University Press. ^ Nuzzo, V.A. 1986. Extent and status of Midwest oak savanna: presettlement and 1985. Natural Areas Journal 6: 6-36. ^ Penfound, W.T. (1962). "The savanna concept in Oklahoma". Ecology. 43: 774–775. doi: 10.2307/1933481. ^ Abrams, M.D. (1992). "Fire and the development of oak forests". BioScience. 42: 346–353. doi: 10.2307/1311781. "Upper Midwest forest-savanna transition". Terrestrial Ecoregions. World Wildlife Fund. "Central forest-grasslands transition". Terrestrial Ecoregions. World Wildlife Fund.